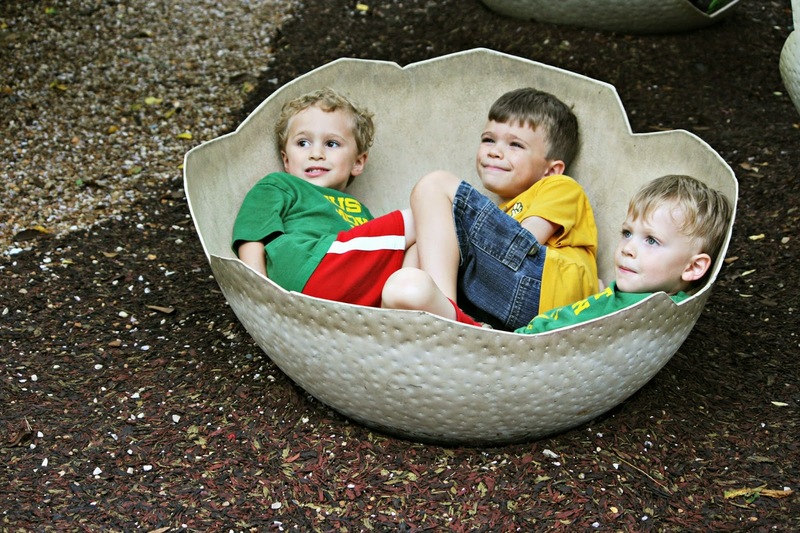 Here are the boys, in a dinosaur egg sculpture at the NC Zoo (picture taken in August). I could have done a big zoo post, but instead I've been straggling out the pictures in random posts. A little easier on me, a little easier on my readers! When I was in high school, I loved this 80s movie called Better Off Dead. I hadn't thought of that movie in years, but recently remembered it. I got it from the library, and Paul and I were both amused by the classic cheesy 80s humor. I was surprised to find that I still remembered many lines. This month I hit 1000 miles for the year with my running. September is the earliest I have ever hit 1000 miles. If I can stay injury-free, I should have a good mileage year. Even if I am still not racing. Everyone keeps saying this is going to be a another bad winter. This gives me anxiety. I worry about balancing the jobs with kids home from school and snowy roads. I hope it all works out. With one job, it isn't a big deal if I have to cancel (I just feel bad because my client relies on me so much). But with the teaching job, if they don't close the school I need to be there if at all possible, so that's a little more tricky. I will just have to hope that if we do get big snows, it isn't on my teaching days! Linking up with Tanya's Willy Nilly Friday for the first time this week. Nice photo of the boys, that was a fun trip. The bad thing about winter is that it doesn't have go be snowing for them to call off school, just a forecast of snow has done it and then it never does anything and there you sit at home. They have no clue about the weather so all we can do is prepare for anything and not worry about it. I am also fretting because they keep saying this will be a hard winter. We should all move into apartments in town. I love this...all I can think of 'bout now is when the boys are all grown adults this will be a memory in their hearts AND mind! This is your cutest picture EVER! EVER! As to the winter, people always say it's going to be a BAD winter. They love to talk about his. But I don't put too much credence in it. After all, It is WINTER, and it is the anti-spring. But since there is so much global warming, wouldn't you think it's got to be getting better? 1,000 miles! That's awesome, Lisa. Je pense que ce moment restera gravé dans l'esprit de ces enfants, très longtemps. Très jolie photo. I'm just sort of bracing myself for a bad winter, too. Maybe we both will be surprised. haha those baby dinos are too cute! i've heard about the bad winter too and it scares me because i have to kids driving now and i get so worried of them driving in snow :( it will all work out though, you'll find your groove! wow, congrats on the miles, that's awesome! thanks for linking and have a great weekend! Now those were some cute baby dinosaurs! That's a lot of running indeed. I can't run anymore (I have bad ankles) but I'm trying to walk a little more now that it's cooled down enough to be comfortable. I dislike winter but according to the Farmers Almanac the area I live in is suppose to have a mild winter. Good in some ways bad in others. Cute photo of the boys inside the egg. Wishing you all the best with the winter coming up. I prefer to believe that the winter will be pleasant. But at the same time, I'm making plans to visit southern California after Christmas to see what sunshine looks like. Your babies are so cute in that egg! I bet they loved doing that. Good for you on the running! I've heard predictions about a bad winter too, but no one can say for sure. Hopefully, your school will close for snow too, especially if they have many commuter students. I know you will do perfect in balancing all that you do! And we admire your zest for life and runnning! I wonder if your boys are old enough to enjoy Roy Chapman Andrews book about finding dinosaur eggs in Mongolia. Until he did that, in the 1920's, no one knew if dinosaurs laid eggs or had live birth babies. It's a childs book, and the one I had was written in big print, with lots of drawing of his expedition. I hope it becomes a classic keeper for you. I'm sure with you about the winter . .
gotta trust everything is gonna turn out right . .
What fun to get inside an egg ! I am trying hard not to worry too much about another cold winter. At least we didn't have the snow along with it last year. It is hard with so many responsibilities and people depending on you. I sympathize. Way to go on the mileage! Nobody knows what this winter will be like until we are in it. Every year, they like to scare us and it rarely comes to fruition. Just take it day by day and it will work out just fine. I hope it's not too snowy. We'll just have to wait and see. Things have a way of working themselves out. Such a cute photo of your little dinos. My boys have been big into Jurassic Park. That's such a different view of dinos. Your photo is cute, in Jurassic Park they are scary. I don't like driving in the inclement weather either, nope, nada bit!